Oyong Mix with Eggs is one of some foods that my children likes. 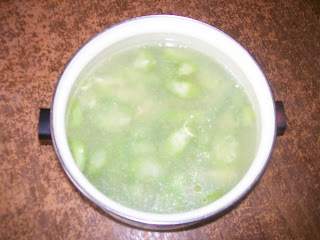 This food is very simple to cook, and we just need a few minute to cook, it is about 5 minutes. First, clean oyong and cut into small pieces. Refine garlic. Whip the eggs. Heat one teaspoon of oil and take in garlic, then add oyong, cook in 1 minute. Boil the water and take in oyong, add salt and sugar to taste, and add eggs . Cooking in 3 minutes. This food is ready to serve.